Family, Stamping and FOOD! : Lesson Plan - Letter "G"
Lesson Plan - Letter "G"
Here's our "lesson plan" for letter "G"
Practice writing the letter "Gg"
Scripture Memory: 1 John 4:8 "God is love..."
Silly Song or Nursery Rhyme "Green grass grows all around"
Social Studies concept: Learn about job of Garbage Collection and Recycling (coloring page), read Why Should I Recycle? Adorable books. Happy I found you through the Hop today. What great letter G activities! I love the emphasis on gorillas - what fun! 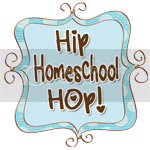 Glad to meet you through Hip Homeschool Hop!